The OneNYC initiative is a dense, comprehensive plan to reduce garbage output, increase green energy, make roads safer, improve recycling rates, and divert organics from landfill. New construction projects can feature “techno-trash” solutions that are futuristic and efficient. 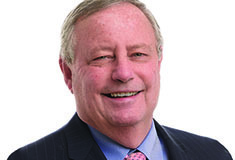 New York, NY Ed Steffelin has joined leading commercial real estate capital markets advisors George Smith Partners as senior vice president to oversee the firm’s new Manhattan-based office. We started this journey shortly after I began to work at American Furniture Rentals, Inc., it became obvious that even with more than two decades of experience in the office furniture industry, I knew little about the furniture rental business. What was your greatest professional achievement or most notable project in the last 12 months? Promoted to vice president. What trend(s) do you predict to dominate your industry in 2019? Additional affordable/supportive housing projects and addiction treatment facilities built.